Hello, my name is Hannah Musgrove. I do a lot of skiing and kayaking and I have recognized the benefits for both the sports. One of the benefits of kayaking is dealing with fear. After a little time in the sport, you realize that rapids aren’t really that scary, especially when you’ve done them a few times. It’s really all about practice. It’s the same for kayaking, skiing and basically all sports. Practice and spending time in your kayak is the only way to get better and the more you do it, the less fear you have. The more you overcome fear the more confident you become. Another benefit of kayaking is the sport is always outside. With this you are seeing amazing scenery, you get time away from screens, you’re getting Vitamin D and it makes you feel happier and more relaxed, you meet great people who like being outside too and kayaking as much as you do. Lots of problems in our day and age come from people always looking at screens and not getting outside enough. This is really unhealthy. People should be getting outside and trying sports like kayaking. A final benefit of kayaking for me, is that it helps with other sports. For me, it helps with skiing. When you tilt your kayak to go across a current, it’s really similar to tilting your skis to make a turn down the mountain or traverse across the mountain. Another skill that is practiced in both skiing and kayaking is stopping. When you go into a eddie you turn your boat horizontally and tilt as you go across the eddie line. It’s the same with skiing, to stop without snowplowing, you turn horizontally and tilt your skis. In conclusion, kayaking is an amazing sport to learn and it fits in really well with skiing because they are off season from each other. Getting outside in general has a lot of great benefits for your health and well being. 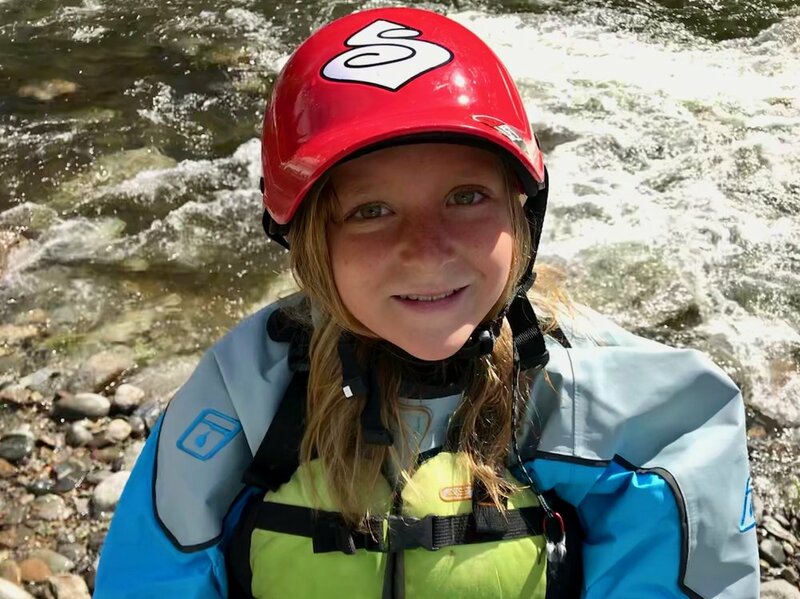 11 year-old author, Hannah Musgrove, is an active member of the Cali Collective Junior Ambassador Team. In addition to whitewater kayaking and skiing, Hannah is a medal-winning gymnast and honor roll student. Keep your eye out for this little lady! All words and images copyright California Women’s Watersport Collective 2019. All rights reserved.